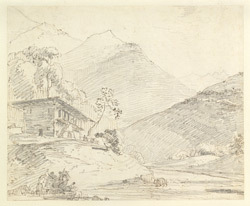 Pencil and pen-and-ink drawing of a landscape in Garhwal by Thomas (1749-1840) and William (1769-1837) Daniell, April 1789. Garhwal (Land of the Forts) is situated in Uttar Pradesh in the north of India. The region has had a turbulent political history but is of great religious significance as the Ganga and Yamuna Rivers both have their sources in the mountains here. The Hindu reformer Shankara came to this region in the 9th century and incorporated many of the Buddhist shrines in the area into Hinduism. He founded four main 'yatra' or pilgrimage temples which are visited by pilgrims each year between May and November once the snow on the mountains has melted.